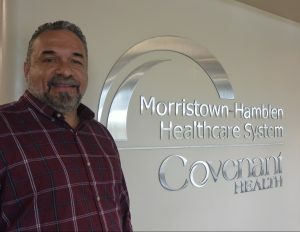 Glen has been a volunteer chaplain at Morristown-Hamblen Healthcare System for three years. Our volunteer chaplains are here to support our patients, family and friends of patients, and even the staff at MHHS. Volunteer chaplains like Glen help not only by offering comfort and prayer, but sometimes just listening. Glen enjoys being a person who can give people hope, comfort, and direction as well as being able to bring peace to families. He is very passionate about what he does, and what the chaplaincy program does for others. This week is Glen’s on-call week. That means he is available 24/7 throughout the week, with many times being called in the early morning hours. He enjoys it though, and loves being there for people who need emotional and spiritual support. We are grateful that we have volunteer chaplains like Glen who are passionate about what they do and donate their time to make a difference in someone’s life. Glen loves spending time with people which is evident in his ministry. He is the senior pastor at Captive Free Ministries in Talbott, TN. Founded in 2008, Captive Free Ministries is a nondenominational church whose mission is to love, unite, and restore. Everyone is welcome and it is a church that loves everyone. His wife, Sandra, is very involved in the church as well. They have been married 24 years and are happy parents as well as grandparents. Glen is a board member of Global Ministries out of Houston, TX and helps with Project Hope. In his spare time, he also enjoys deer hunting. We hope you enjoyed getting to know Pastor Glen Dockins and stay tuned for the next Volunteer Appreciation Week spotlight. If you are ordained and interested in being a volunteer chaplain, please visit www.morristownhamblen.com/volunteers.